Just like Lady and the Tramp! Well, almost. You can't really do the noodle trick with spaghetti squash... but do you really need to mimic cartoon dogs on a date? Exactly. And you definitely don't need to consume hundreds of extra carby calories when a spaghetti craving hits. Microwave whole squash for 3 - 4 minutes, until soft enough to cut. Once cool enough to handle, cut squash in half lengthwise. Scoop out and discard seeds. To a very large baking pan (or 2 medium pans), add 1/2 inch water. Add squash halves, cut sides down. Bake in the oven until the insides are tender, about 40 minutes. Meanwhile, spray a baking sheet with nonstick spray and set aside. Combine all meatball ingredients in a large bowl. Mix thoroughly with your hands. Evenly form into 6 meatballs and place on the baking sheet, evenly spaced. Bake in the oven until just cooked through, about 10 minutes. (Meatballs can bake simultaneously with squash.) Set aside. Once squash is cool enough to handle, use a fork to scrape out 4 cups of the strands and transfer to a strainer to remove excess moisture. (Reserve remaining squash for another time.) Transfer to a large bowl, cover to keep warm, and set aside. Bring a medium pot sprayed with nonstick spray to medium-high heat on the stove. Add onion and carrot; stirring occasionally, cook until slightly softened, 6 - 8 minutes. Add garlic and cook until fragrant, 1 - 2 minutes. Add all remaining sauce ingredients except Parm-style topping; stir to combine. Add meatballs and bring sauce to a low boil. Reduce heat to low. Gently stirring occasionally, simmer until veggies have completely softened and meatballs are hot, about 8 minutes. 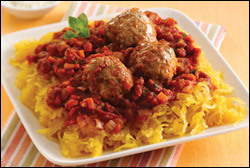 To serve, evenly distribute strained squash strands between 2 large plates or bowls. Top each with 3 meatballs, half of the sauce (about 3/4 cup), and 2 tsp. Parm-style topping. Enjoy!!! 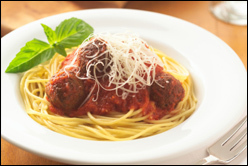 HG Alternative: This recipe can also be made with 1 1/2 cups of jarred low-fat marinara sauce... But our sauce is reeeeallly good! Pass along this recipe to current pals, childhood chums, family members... Everyone! Click "Send to a Friend" now! It's National Punch Day, September 20th. No, this does not mean you can go punch all the people who annoyed you by observing International Talk Like a Pirate Day yesterday. Instead, celebrate with some 3-ingredient Fizzy Fruity Pineapple Punch!